Next post: Ultimaker 2 – Use 5v controlled fan to also get a 24v controlled fan. Hello Jakob. I don’t understand the Servo Angles in regards to BLTouch. Is it just a deprecated value called angles, that has some other function on BLTouch? Asking as the pin goes straight up and down, so not sure what 10 and 90degrees actually means here? Not that i am really any kind of expert :). The bltouch emulates a servo type probe , so in order to trick firmwares into thinking it was really a servo this was build into the logic- at least that is the logic i apply to this. So it is likely a legacy, but why change it, as that would likely break the functionality build into any number of firmwares. Most r/c servos operate on PWM (Pulse Width Modulation). It ranges from 0 to 1520 pwm giving it a 120 degree range. Most servos are centered at 760 and the input from the transmitter tells it to move one way or the other. 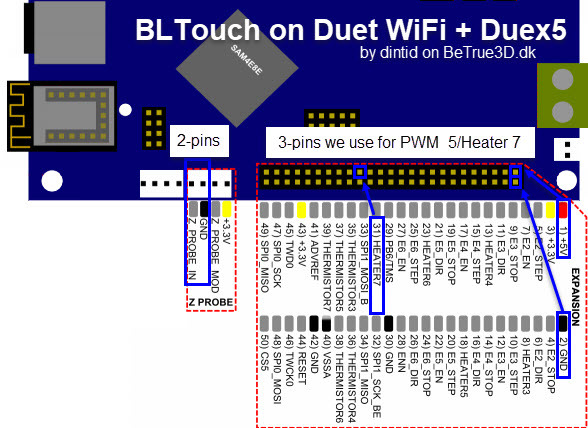 The bl touch pin is deployed or retracted telling the “servo” to go to 10 degrees (a specified pwm) to deploy and 90 degrees ( a different pwm) to retract. It’s a signal to control it.